QUESTION Where is Blue Lagoon and Monkey Island located in Jamaica? Mr. Wellesley, where is Blue Lagoon and monkey Island in Jamaica. A friend of mine visited Jamaica recently and told me about his trip to those exotic locations. I will on vacation in August and I would like to visit these locations. Glad to know you’ll be coming to Jamaica for your summer break. Can’t argue that it is a great choice. So many unexplored places to visit and some places deserves a double or triple take. On that note, the infamous Blue Lagoon is one of them. It is by far one of the most breathtaking places here in Jamaica and it’s worth every dollar. In my opinion Lagoon maybe an understatement. This body of water does represents its colours well but not its depth entirely. On any given sunny day you can watch the colours of the water changes while the sun passes through the hours of the day. Located along the coast of Port Antonio, Portland. It is truly a sight to behold and place to relax. For non-swimmers like myself, there is the opportunity of walking around the lagoon and sit on various ends. For swimmer, there is no problem helping yourself to a few breast strokes but keep it in mind the Blue Lagoon is also known to be without and end; so swimming is at your own risk! Truth be told it was recently confirmed that Blue Lagoon does have a depth, ranging between 180 to 200 meters deep. Formerly known as The Blue Hole, the name change came after actress Brook Shields did the movie Blue Lagoon back in 1991 which features the Lagoon. The water is a combination of salt and fresh water; Underground stream and springs flow feeding into the lagoon and out into the sea. That will explain the cold to warn change over when you get in, which is also quiet healing to the body. Monkey Island, which is within reach by boat or raft. This island sits offshore the mainland but is also along the Port Antonio coast and visits can be arrange to go during the Blue Lagoon Tour. Snorkeling, rafting, swimming and selfie (photographs) moments on the Folly Ruins (situated across from Monkey Island) are a must do. Tours can be arrange to visit these island, cost ranging from 30 USD to 280 USD depending on which part of the island you’ll be coming from (Kingston, Ochi Rios, Negril). If you decide to use a tour guide, I’m sure they’ll give you a more detailed history lesson on the places and the people that once lived and came to its grounds. 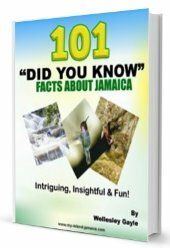 Every time you list new articles about sweet Jamaica my heart sings with those memories that one can only have with the first hand experiences that come from living and working with Jamaicans in your beautiful country!